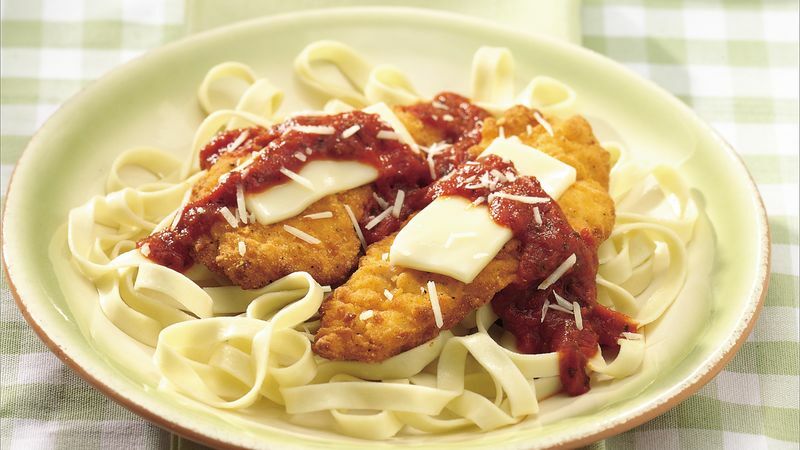 Bake chicken breast tenderloins as directed on package, placing mozzarella cheese slices on chicken during last 3 minutes of bake time. Meanwhile, cook fettuccine as directed on package; drain. Place pasta sauce in small microwavable bowl; cover with microwavable paper towel. Microwave on High 3 to 4 minutes or until hot, stirring occasionally. Serve chicken over fettuccine. Top with sauce and Parmesan cheese. Dried linguine, spaghetti or vermicelli are fine alternatives to the refrigerated fettuccine, but the refrigerated pasta cooks faster. Serve this recipe with an Italian salad blend tossed with tangy Italian dressing.